It takes precise measurement to make sure your wheels and tires fit properly in the wheel well, without rubbing against the fender or vehicle components. 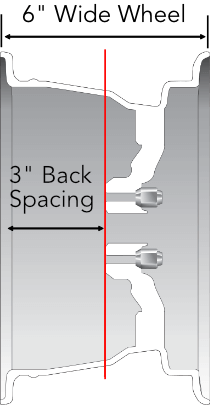 Two important measurements that describe wheel’s proper position are offset and backspacing. 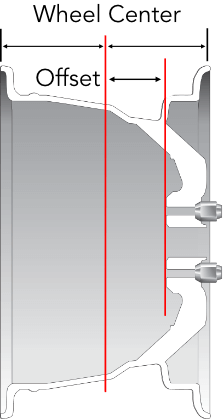 Offset measures the distance between the wheel’s mounting surface and centerline, while backspacing measures the distance between the wheel’s mounting surface and innermost lip. These measurements help determine which wheels are compatible with which vehicles, so you will need to be aware of them if you decide to install aftermarket wheels. To properly understand wheel offset, you must first know the basic characteristics of a wheel assembly. The offset describes the wheel’s ideal position, so that it can freely rotate without rubbing against the fender or the brakes. Technicians determine a wheel’s offset by measuring the distance between its centerline and the mounting surface. 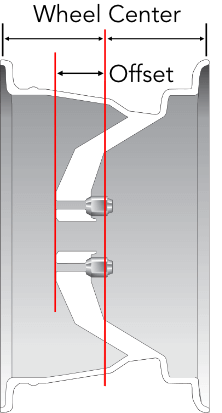 Millimeters are used as the standard unit to describe offset, which can be positive, zero, or negative. 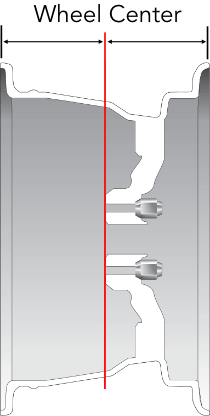 Every vehicle has a specific offset. Modern front wheel drive vehicles usually have positive offset, while older or customized vehicles may have a negative offset. Most wheels have their correct offset data embossed on the mounting surface or on a spoke. Check out the diagrams below for a visual illustration of each offset type. The mounting surface extends past the wheel’s centerline, closer to the face of the wheel. Many factory rims have this offset type. The mounting surface is centered within the rim, aligned with the wheel’s centerline. The mounting surface sits before the wheel’s centerline, closer to the back of the wheel and the car’s suspension system. Backspacing is an older system of measurement to determine how deep the mounting pad is located in the wheel. Correct backspacing allows enough room for the suspension, brake, and steering systems to operate without interference from the wheel. Positive offset creates more backspace, while negative offset reduces backspace. The example shown here is 6 inches wide with a 3 inch backspacing. This would be the equivalent to a zero offset wheels since the mounting surface aligns with the centerline of the wheel. Technicians determine the correct backspacing by measuring the distance between the wheel’s mounting surface and the innermost point they want the wheel to extend into. Like offset, each wheel’s proper backspacing depends on the vehicle’s size and design. The knowledgeable technicians at America's Tire will be able to properly determine your vehicle’s correct offset and backspacing. Based on these measurements, our employees can assist you in choosing wheels that both fit your vehicle and your aesthetic preferences.